Very beautiful Cottage on the lakeshore in Lake Maggiore, right in front of the beach a very nice villa divided into two sections, in one leave a very discrete owner a very nice welcoming lady, and the other is for rent, large common courtyard, wonderful and peaceful place where to pass an unforgettable vacation, guest will have at their disposal also an equipped external area with table and chairs where to enjoy the lake and surrounding panorama while having a dinner or a simple glass of wine! Down at the lake (near the dock area) there’s a corner equipped with beach umbrella, table, chairs, deck chairs. The main level of the house features a very large living room with sofas, pool table, fireplace and TV. On the right, there's the dining room and a well-equipped kitchen which has a direct access to the garden with covered gazebo, and barbecue. the sleeping area features single bedroom bed size (200x100 cm) with a bathroom with shower, adjacent; master bedroom with two single beds joinable to become double the bedroom has a private bathroom with shower. This bedroom is accessed both through the foregoing single bedroom and directly from the outside. The windows of this bedroom are equipped with mosquito nets. The loft area features a second double bedroom, this bedroom overlooks the main-level single bedroom (no doors, just a low balustrade) and has an air-conditioning unit; Adjacent, there’s a smaller, simply furnished single bedroom, appropriate only for children with a single bed (190x80). Possibility to add a baby bed on request. Please note: The stairs leading to the loft are narrow making it necessary to carefully watch your steps as you go down. No bathroom available at the loft level, therefore it is necessary to use the bathroom downstairs and the night navigation could be not easy. In addition, the loft is not suitable for very tall people as the ceiling is quite low. The beach is 50 meters from the villa. 2 golf courses within 10-15 min. by car and 7 more within 45 min. The ferry 10 minutes away on foot. There is also a pedestrian route behind the house that offers a panoramic view of Lake Maggiore and that leads (5 min.) to the nearby town of Lesa, full of shops, restaurants etc. 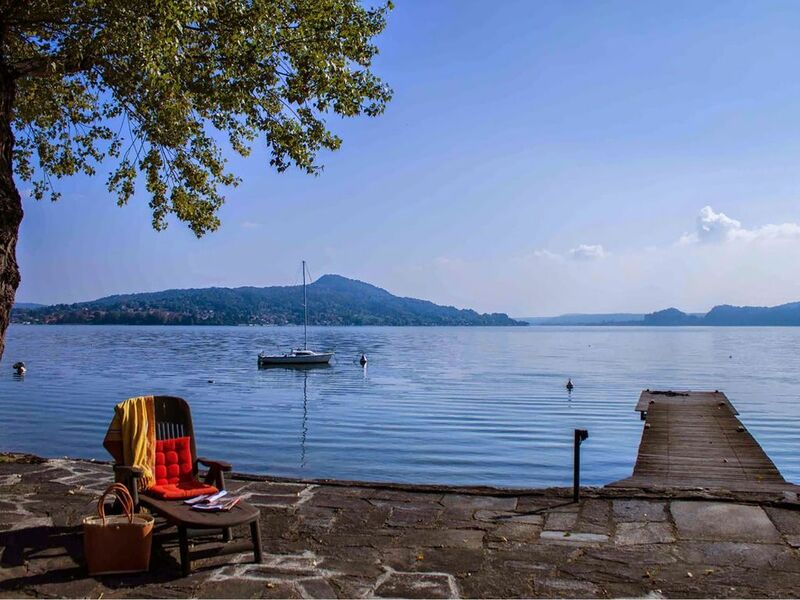 In a surrounding of extraordinary beauty, Lake Maggiore offers to its visitor’s spectacular gardens boasting exceptional collections of camellias, azaleas and rhododendrons. An impressive number of parks are located here such as the Parco Nazionale della Val Grande (the largest wilderness area in Italy). In the centre of the lake, the three enchanted Borromeo Islands float. The towns surrounding the lake are simply gorgeous full of colors, the car free town of Orta San Giulio is a little jewel. A 30% Non Refundable deposit is required upon confirmation; the final balance is due within 75 days prior to arrival. Euro 800,00 that will be collected on arrival and it will be returned upon departure less any charge in case of damage to the property. The listed price is for 5 people. A 6th person is accepted if not older than 6 y.o at 150,00 Euro.